Welcome to the website of the Carmelite Spiritual Center in Darien, Illinois. We are located at 8419 Bailey Road in Darien, Illinois.We believe that God is present in every person, event, and experience of our lives. Sometimes we need to get away or slow down to listen to our life – to the voice of God. The belief that God speaks through and embraces every experience of our life underlies all the programs we offer here at the Carmelite Spiritual Center. The rich tradition of Carmelite spirituality and hospitality provides a setting for a variety of programs for men and women seeking a deeper experience of God and of themselves. We welcome groups who facilitate their own meetings, retreats, or workshops. Our facility offers 58 comfortable rooms with private baths. 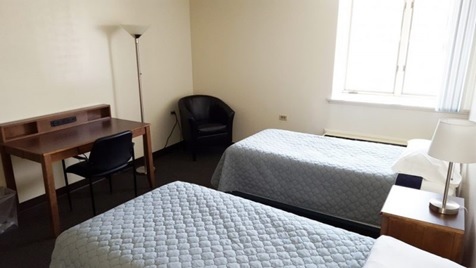 Each room has two beds, a desk, closet, and individual heating and air-conditioning controls. The entire facility is air-conditioned and for everyone’s health and safety, there is no smoking indoors. 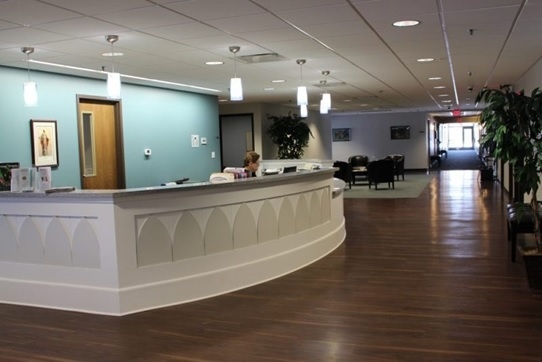 Delicious home-cooked meals and the warm hospitality of our staff are hallmarks of our Center. 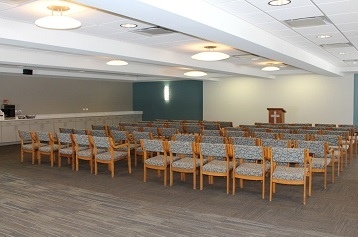 Meeting Rooms The Spiritual Center has many multipurpose meeting rooms accommodating groups from 15 to 150. All are comfortable, carpeted spaces ideal for retreats, days of renewal, seminars and conferences. Call office for rates and availability. Our complex is also home to the beautiful Shrine, Museum and Chapel devoted to Thérèse of Lisieux, the Little Flower. The lovely Chapel and Museum, open to the public everyday, have been enlarged and renovated and provide a prayerful space for your private reflection. Mass is offered Monday-Friday at 11:30 AM in the Chapel. 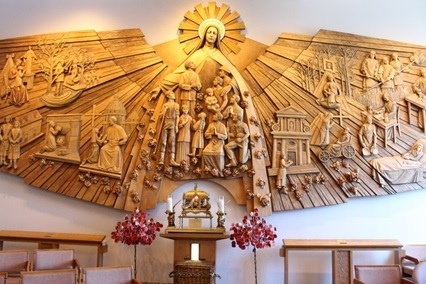 The front of the chapel is dominated by a massive wood carving of the life of St. Therese. It tells her whole life story in a visual and beautiful way. It is the largest wood carving of a religious nature in the United States. The center of the National Shrine is a chapel, dominated by huge stain-glass windows that depict the journey of the soul to God, modeled on St. John of the Cross’ Ascent of Mount Carmel.